The Elder Races series has become my BDB replacement. It’s totally cracktastic. After reading Wandergurl’s review and at the urging of Decadence and Kate, I finally picked up the first book in Thea Harrison’s Elder Races series. Pia Giovanni is blackmailed into stealing from Dragos, Wyr (shapeshifter) leader and one of the most powerful creatures in the world. She’s on the run, but he’s determined to find out who stole his…penny. Dragon Bound gets off to a snappy start, with Dragos’s pursuit of Pia and her attempts to elude him. Dragos’s enemies are determined to bring him down, and Pia is inadvertently swept up in their conflict. Her life has been based on the need to protect herself, but with Dragos refusing to let her go, it seems her secrets may put her in even greater danger than either of them could have anticipated. Dragos is your typical alpha male, leader of a savage community, whose ruthlessness is suddenly tempered by his fascination with—and later love for—the heroine. Pia is not exactly weak—she has her own skills and resources—but her greatest strength in the relationship is her ability to understand Dragos’s nature and help him be a better person. Species. Wyr. Whatever. If you like sassy heroines, there’s plenty of it in Dragon Bound. One of my favourite scenes is when Pia gets drunk with the PR representative for Dragos’s corporation and they indulge in a bit of girl bonding. Yes, the writing is sometimes mired in purple prose (‘broad mushroom head’—yes, it’s exactly what you think it is) and the kind of awkward language (‘I’ll pursue that comment later.’ Really? Do people talk like this?) 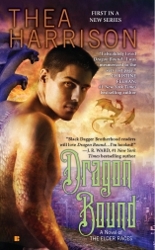 that fans of paranormal romance readers regularly endure—perhaps even enjoy, because who am I to judge?— but Dragon Bound also embodies all that we love about the genre. Tagged 2011 releases, elder races, shapeshifters, thea harrison. I have read very little paranormal romance this year. I have bought this one, but I haven’t actually read it yet. Maybe over the holidays. It totally is cracktastic! I have read and loved each book and am counting down the days for the next installment. And the fifth book will focus on Pia and Dragos again. Yay! I’ve listened to Dragon Bound, Storm’s Heart and Serpent’s Kiss on audio – the narrator (Sophie Eastlake) is a newbie but excellent. She totally gets the snark. What I think I love most about the series is that each book is quite different. I’ve seen some people complain that the second book wasn’t as good – I thought it was a little less strong, but I still loved it. And I thought Serpent’s Kiss was just about as good as Dragon Bound. The conflict in each story is different and the world the author has created is so vast, that she can really do whatever she wants and the series could go on indefinitely. I’ve been so keen to read this book being (as you know, lol) a massive BDB fan – also because I thought it might break through my romance ennui. But I’m about half way through and have no drive to finish it whatsoever! Pretty disappointing… (there might be something wrong with my brain). Isn’t this a fabulous book? 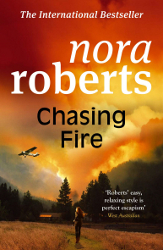 It was my most re-read novel of 2011. I didn’t care for the second book as much, but I adored the 3rd and 4th books. Oracle’s Moon – her upcoming release – is easily as good as Dragon Bound. Maybe even better (though much different). I wish Harrison would write faster!